MultiBrief: Are you being served? What about your customers? Are you being served? What about your customers? Who do you know who would purposely understaff an airport rental car location at a major resort locale so customers are kept waiting for two hours for pre-reserved, prepaid rental cars? How often do you tell your wait staff to bring the wrong dish to a customer (twice) or serve food that is dry, overcooked, and tasteless? When would you set up an interactive voice-response system so confusing that customers are forced to spend long periods of time to navigate their way into the right queue — only to then be disconnected? Not many of us would ever want those things to happen to the customers of our businesses. And yet, much too often, they do. If we start with the assumption that most businesses do want to serve customers in a way that keeps them coming back, how can incidents like these occur on such a frequent basis? Management says one thing then does another. Customers are our first priority — that’s what we say. But when the rubber meets the road, that’s not what we actually do. Compensation rewords the wrong behavior. Employees are compensated for meeting metrics such as the numbers of customers served per hour, rather than how often customer complaints can be appropriately resolved without further escalation. Standards aren’t set high enough or they’re not enforced. 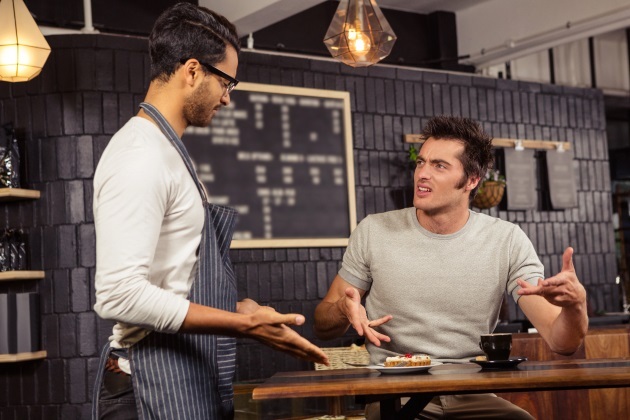 It’s acceptable to not serve customers the best quality product or service; therefore, no one is particularly disturbed or surprised when bad service occurs. There’s no repercussion for bad behavior. There’s no consequence for issues that occur when employees who treat customers badly. It’s business as usual, regardless of the quality of the experience, and customers realize this. Employees feel nothing they do really matters anyway. This is magnified when employees feel a big distance between themselves and management — whether it’s because they’re physically remote, many levels down in the organization, or when their input and feedback aren’t heard or acted upon. Walk the talk. Make sure what you say and what you do are congruent. If you expect attention to customer experience, make sure your executives model this behavior. Choose the right metrics to encourage proper behavior. Reward actions that matter, rather than setting arbitrary targets that are meaningless and potentially harmful. Then let the whole organization know who the heroes are and why. Set high standards and reinforce them. Be clear as to what you expect. Anything less than that will not be tolerated. Identify the consequences for not making the grade, then follow through. Solicit and integrate employee feedback. These are the people closest to your customers. If they tell you they need more staffing to properly handle high customer traffic on a particular day, listen to them. If they tell you customers aren’t happy with the quality of the food they’re being served, take this to heart and find out what’s causing the issue. Why would you ignore what they are trying to tell you? There’s another great way to understand what’s really going on: shop your own business. That might be in person, by phone, or over the web. Regardless of the method, make sure staff does not know they are dealing with the boss. See how you’re treated when no one knows management is on the other end of the line. Are you satisfied with how you were treated? Were you properly served? If what you experiences isn’t good enough for you, how can it be acceptable for your customers? Linda J. Popky, founder of Leverage2Market Associates, is an award-winning Silicon Valley-based strategic marketing expert who is the author of the book "Marketing Above the Noise: Achieve Strategic Advantage with Marketing that Matters." Follow her on Twitter at @popky #mktgabove.